Matthew 7 reaches the most quoted verse, not only from Jesus’ teaching, but most referenced in the entire Bible, at least the most paraphrased; Judge not, lest you be judged. As we studied this portion of the scripture, something jumped out at me I had not seen before. Every reference Jesus uses to make his point from 7:1 – 7:20 involves the eyes. By the same scale you judge others, so you will be judged; the way you view others determines how they will view you. Let’s be clear on this point, the judgement Jesus refer to here is not discerning right from wrong, this judgement is not only permissible, but is required of Christians. The judgement that will condemn us is that of assigning motives to another person’s actions. Call out sin as sin, but do not assign motives for its commission. Deal with the plank in you own eye before trying to remove a splinter from someone else. Again with the eyes. Take care of your own faults because you are no better than you neighbor. Then we hear an analogy for giving and parenting. Who’s child would ask for a fish and be given a snake? Or call for bread out of hunger and be handed a rock? Even the worst of humanity know how to treat the ones the love, how much more generous will your Father be to you? So if the righteous are not evident by their ability to determine unrighteousness or their diligence at public behavior modification, how are we to know who is and who isn’t? With another analogy; by the fruit they bear. Good trees produce good fruit, bad ones do not. Likewise, good people are obvious by their lifestyle, you can see it in their eyes. The physical, spiritual and emotional health of a person can all be determined by looking into their eyes. The presence of life cannot be described, but the evidence cannot be hidden from view. 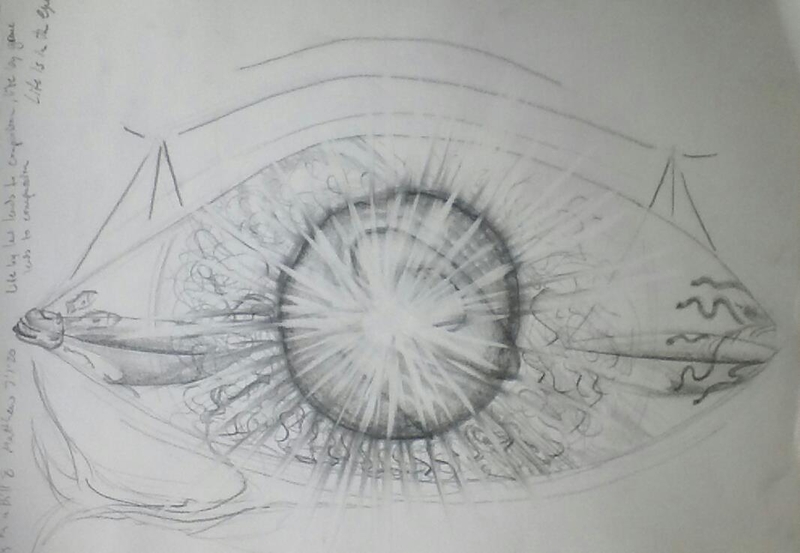 Today’s drawing is every reference Jesus made to show us how to live through Grace, assembled together to create an eye. Living by the law leads to comparison, living by grace leads to compassion.